I have written before about my recommendations for essential genealogy books and today one of them is on sale 40% off. If you do not already own Evidence Explained: Citing History Sources from Artifacts to Cyberspace by Elizabeth Shown Mills, the publisher has the second revised edition for $35.99 down from $59.99. In addition to this book being the best reference available for genealogical citations, it also contains an excellent chapter on evidence analysis. I recommend that this book be on every genealogist's desk as a handy reference. I received the following press release from a colleague of mine and fellow ProGen Study Group member, Jennifer Holik. While I usually feature educational opportunities for genealogists on my blog, these are unique new books for getting kids interested in genealogy and teaching them beginning research skills. Professional Genealogist, Jennifer Holik, of Generations publishes six new genealogy textbooks for kids. 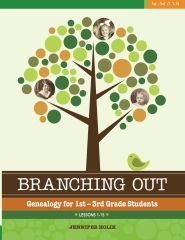 Parents, teachers, and genealogical societies looking for a how-to genealogy textbook for elementary through high school-aged students need to look no further. 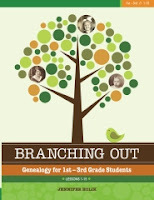 In Branching Out, a new series available from Generations, author and professional genealogist Jennifer Holik provides parents and educators with the tools they need to teach genealogical research skills to children and teens. The books are available on CreateSpace in paperback form at the links provided. The PDF and PowerPoint files are available at the Generations Store at: http://www.e-junkie.com/generations. I received this press release with the request to post it from three different sources today. I am always happy to post information on quality genealogy educational opportunities. There is excitement over the new course offered by Tom. Jones, but all the courses look excellent! The International Society for British Genealogy and Family History today announced its course lineup for this year’s British Institute. This weeklong, intensive institute will be held from 8–12 October in Salt Lake City. This year’s host hotel is the Radisson Downtown, located two blocks from the Family History Library. Registration is now open and class size is limited. Join us as we learn about the records and strategies needed to begin research in England. This class will begin by teaching a strategy for 19th and 20th century research, then study the three basic records needed to find families in that time period. From there it will expand to those records needed to find supporting information, including maps, gazetteers, probate, and reading handwriting. Genealogical statements and conclusions achieve credibility when they meet standards for proof. Participants will learn how to use widely accepted standards to measure their genealogical work’s accuracy and to assess the work of others. Why take this course? The answer is many of the population were involved in these entities throughout time. There is a high probability that somewhere you have a military-connected ancestor. The British military course will cover a wide variety of records that will assist you in tracing your military ancestors. We will discuss the records of military personnel for the outlined time period which are centered (or held) at the regimental level. This means that one must know the regiment (pre-1881) to be able to trace an ancestor. Post-1881 is a bit different, in that there can be indices available that cover the time period as well as civil records which are critical as an additional locator record. Websites containing military records will also be discussed. This course was first introduced in 2011 and will again focus on the methodologies needed for successful Irish research. 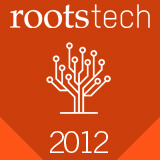 New record sources and strategies will be introduced for 2012 with a review of best practices. Learn how to frame your tough Irish genealogical problems, develop a sound strategy and sharpen your analytical skills with these advanced methods. You’ll also enjoy the richness of the Irish collection of the Family History Library and explore some of the lesser known records of this vast resource, a must stop before leaving for Ireland. More detailed information on the institute can be found at the ISBGFH’s Web site http://www.isbgfh.org. You can register online, or print, fill out the application and mail to ISBGFH, PO Box 350459, Westminster, CO 80035-0459. If you have any questions, please e-mail admin@isbgfh.org. When registering at the Radisson Downtown Salt Lake, ask for the British Institute conference rate. The International Society for British Genealogy and Family History has been around a long time–longer than it takes to say the full name. Many of us who have been involved for years talk about “ISB” not only for convenience, but because the nickname suggests what the organization is—small, practical and friendly. ISB got started in 1979 due to the efforts of several people who saw the need for an organization that would help genealogists tracing the origins of their British Isle emigrant ancestors. Thus it is no surprise that the members of ISB live all over North America and overseas. The Society continues to evolve but it retains its original purpose. ISB is here to help members overcome the challenges of researching British Isles roots from a distance. See http://www.isbgfh.org for more information. NGS 2012 Early Bird Registration Discount Ends Soon! (Arlington, VA)—EARLY BIRD REGISTRATION DISCOUNT ENDS SOON! 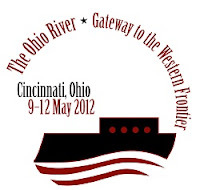 The NGS 2012 Family History Conference will be held 9–12 May 2012 at the Duke Energy Convention Center, Cincinnati, Ohio. Register for the conference today! The early-bird registration discount ends on Tuesday, 20 March 2012. In addition to enjoying a $35 discount, only early birds have the opportunity to order a printed syllabus. (Everyone will receive a syllabus on flash drive.) NGS members get even deeper discounts, so this is a great time to join. Space is still available for most conference social events and workshops including the Friday night NGSQ 100th Anniversary Reception, Tuesday bus tour, museum center tour and dinner, and the NGS luncheon that features local celebrity, Dan Hurley. The opening session at this year's conference will be held on Wednesday morning, 9 May 2012, at 8:00 a.m. The keynote address will be presented by Patricia Van Skaik, manager of the genealogy collection at the Public Library of Cincinnati and Hamilton County (PLCH). This presentation will explore one of the PLCH's most valuable treasures, the 1848 Cincinnati Riverfront Panorama. Patricia will reveal this incredible early photographic snapshot of mid-nineteenth-century life in an important American river town, Cincinnati. Founded in 1903, the National Genealogical Society is dedicated to genealogy education, high research standards, and the preservation of genealogical records. The Arlington, VA-based nonprofit is the premier national society for everyone, from the beginner to the most advanced family historian, seeking excellence in publications, educational offerings, research guidance, and opportunities to interact with other genealogists. Please visit the NGS Pressroom at http://www.ngsgenealogy.org/cs/pressroom/press_releases for further information.